Faced with a 3 hour journey back to my center of intellectual pursuits, Birmingham, (otherwise known as back to university) I decided to branch out from my usual selection of glossy magazines and try something new. So,standing somewhat perplexed and somewhat excited in front of the stand at WH Smith, I said goodbye to Vogue, Elle and Dazed & Confused and selected Company magazine instead. And the verdict? An inspiring and innovative glossy with lots and lots of great, unusual features....and some not so great. I love Kate Bosworth on the cover... she has such a great style (stylist), simple and ultra cool. She just seems nice, y'know? Plus she's always on the 'worst dressed' list for the best possible reasons- hot off the catwalk Jil Sander, Stella McCartney and Chanel looks that the catty tabloids are just unable to comprehend. You go girl! Kate is also a great one to Google on those days when you have absolutely no idea what to wear. However, this cover leaves a bit to be desired. I'm not loving the dip- dyed hair; maybe if it was this time last year, but now, two years after we first saw this trend emerge, it just looks a bit... over. Boring. Next thing please. And the outfit, although being a relatable, accessible look for Company's target market, with just enough trend boxes ticked to give in some high fashion kudos (love the pink trousers and Isabel Marant trainers!) is just not 'wow' enough to compete. Compare with Vogue's May cover with Charlize Theron in a Versace gown; Company, if you want to compete with the big boys, this is what you have to do. However, enough with the bitching! What I loved about Company was its showcasing of the best of ultra-cheap high street brands and low profile mid-range designers- some of which even I'd never heard of! What I especially love though, was their profiling of the gazillion Primark designer rip- offs that are out there and up for grabs! 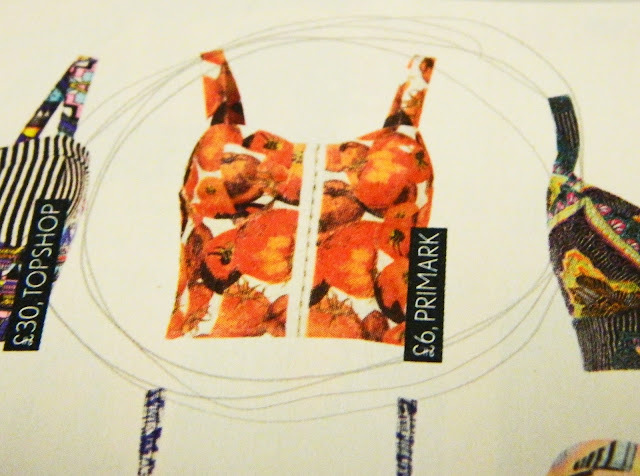 Take this orange- print bralet; a carbon copy of the one from Dolce & Gabbana's S/S 12 collection, shown below. Perhaps taking 'inspiration' a little too far? I fail to understand why there aren't more copyright law suits in the fashion industry! However, as long as Dolce & Gabbana are happy with it, I going to go get me some of their intellectual property for only £6! Kerching! Departing from these happy copywright- fuelled musings, there were elements of Company that weren't so great. 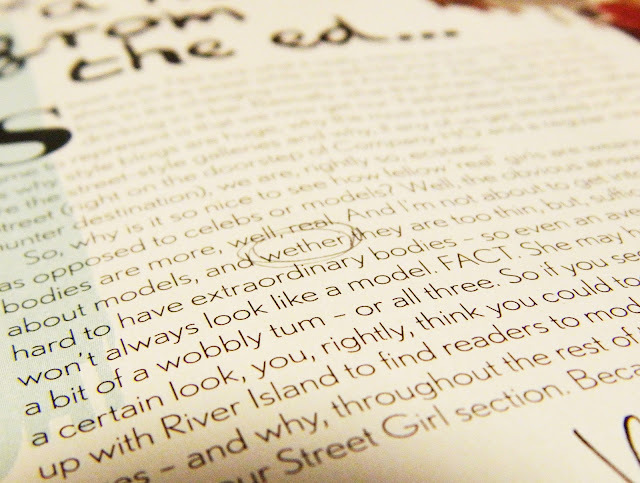 As per always, the first thing I flicked to upon opening the magazine was the editor's letter. I gave it a quick scan: informative, a bit funny and generally a great start to the following sartorial binge. Apart from the massive spelling mistake half way down the page. Come on girls- turn the spell check on. Although you really shouldn't have to for 'whether'. Very, very awkward. And to top it off? A disgusting article from possibly one of the most annoying people in 'fashion' (does she have any experience/ knowledge/ qualifications to credit her writing about the fashion industry, or anything else come to that? ), Jameela Jamil. Urghh. I'm not even going to dignify this piece with a long rant; I think it can be summed up by its tagline. 'Feminism. Confusing, isn't it?' For those who want a clearer, more coherent view (rant) on articles like these, please head to vagendamag.blogspot.co.uk. I promise you that you won't regret it. I'm afraid that I've given a rather horrible account of Company in this blog post, which really doesn't convey how much I actually really enjoyed the magazine! Maybe it come from writing too many English Lit essays recently... the criticism comes easily. If you're a young, fashionably adventurous girl (or guy) on a budget, who wants to read about trends, youthful fashion entrepreneurs (I particularly enjoyed the article on bloggers making it big in the web editing world), DIY projects, and Tokyo street style interpreted on the British High Street, then you're in for a treat! Hey there, randomly came across your blog. As a current art intern at a magazine in Toronto, it's very interesting to read your take on Company. They definitely, first and foremost, need a better copy editor! I know, it's such a ridiculous thing to have missed! And in the editor's letter too!